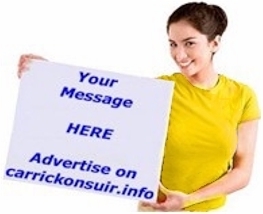 Carrick on Suir official website is the premier gateway for businesses to reach a locally based audience! To advertise on any part of this website other than the business directories, please fill in your details on our contact form and our sales representative will contact you. By default, listings are published for a period of 365 days from publication date, however, shorter terms are available by request. Listings under the 'Property' section remain on this website until the property is sold. To place your business listing in any of our business directories you can try the self-serve option by clicking on any of the following three links to quickly and easily create and purchase your listing and if need be, we can optimise your listing afterwards. The self-serve option is available by clicking on any of the menus below. Add A Business: If you own a general business e.g. shop/business service/manufacturing etc. Add A Restaurant: If you own a Hotel/Restaurant/B&B/Pub/Take-Away/Guesthouse. Add A Property: If you have a house or apartment or land for sale or rent. With the self-serve option, you can log in at any time and update your listing yourself. If you need your listing enhanced, we will be happy to do it for you to ensure you achieve the best presentation possible. Reach Consumers 24/7: Let the consumer decide when it is convenient for them to engage with your business. Unbeatable Value: Carrickonsuir.info can accommodate virtually any budget. Contact us with your requirements and we will suggest the best advertising package for your business. Direct Contact: Visitors can contact you directly from your website advert. Non Fleeting Message: Your advert will be available long after a printed edition has expired. You can also change your advert over time. SEO: By advertising in carrickonsuir.info, your business advert will be displayed at eye-level in Google search results. Reviews & Ratings: Majorly promote your business by having registered users write testimonials about your business. Of course, these are not automatically published. Instead, you will receive their comments by email and you can then decide if you wish to approve (publish) or delete the review. Customer Service: Your time is limited. Carrickonsuir.info offers a local hands-on account executive service to help you every step of the way as well as proficiency in digital specialities to guarantee you the best online advertising campaign for your budget. Hello to all at Carrick, came across your site after finding my grandmother llved there. Ellen O'connor born 1866, married James Cunningham.